For other ships, see Mayflower (ship). For other uses, see Mayflower (disambiguation). Comparison of blue whale (Balaenoptera musculus) (bottom) and the Mayflower (top). The Mayflower was a square rig with a beakhead bow and high, castle-like structures fore and aft that served to protect the ship's crew and the main deck from the elements—designs that were typical with English merchant ships of the early 17th century. Her stern carried a 30-foot high, square aft-castle which made the ship extremely difficult to sail against the wind and unable to sail well against the North Atlantic's prevailing westerlies, especially in the fall and winter of 1620; the voyage from England to America took more than two months as a result. The Mayflower's return trip to London in April–May 1621 took less than half that time, with the same strong winds now blowing in the direction of the voyage. Aft on the main deck in the stern was the cabin for Master Christopher Jones, measuring about ten by seven feet (3 m × 2.1 m). Forward of that was the steerage room, which probably housed berths for the ship's officers and contained the ship's compass and whipstaff (tiller extension) for sailing control. Forward of the steerage room was the capstan, a vertical axle used to pull in ropes or cables. Far forward on the main deck, just aft of the bow, was the forecastle space, where the ship's cook prepared meals for the crew; it may also have been where the ship's sailors slept. The poop deck was located on the ship's highest level above the stern on the aft castle and above Master Jones' cabin. On this deck stood the poop house, which was ordinarily a chart room or a cabin for the master's mates on most merchant ships; but on the Mayflower, it might have been used by the passengers, either for sleeping or cargo. The gun deck was where the passengers resided during the voyage, in a space measuring about 50 by 25 feet (15.2 m × 7.6 m) with a five-foot (1.5 m) ceiling. But it was a dangerous place if there was conflict, as it had gun ports from which cannon could be run out to fire on the enemy. The gun room was in the stern area of the deck, to which passengers had no access because it was the storage space for powder and ammunition. The gun room might also house a pair of stern chasers, small cannon used to fire from the ship's stern. Forward on the gun deck in the bow area was a windlass, similar in function to the steerage capstan, which was used to raise and lower the ship's main anchor. There were no stairs for the passengers on the gun deck to go up through the gratings to the main deck, which they could reach only by climbing a wooden or rope ladder. Below the gun deck was the cargo hold where the passengers kept most of their food stores and other supplies, including most of their clothing and bedding. It stored the passengers' personal weapons and military equipment, such as armor, muskets, gunpowder and shot, swords, and bandoliers. It also stored all the tools that the Pilgrims would need, as well as all the equipment and utensils needed to prepare meals in the New World. Some Pilgrims loaded trade goods on board, including Isaac Allerton, William Mullins, and possibly others; these also most likely were stored in the cargo hold. There was no privy on the Mayflower; passengers and crew had to fend for themselves in that regard. Gun deck passengers most likely used a bucket as a chamber pot, fixed to the deck or bulkhead to keep it from being jostled at sea. The Mayflower was heavily armed; her largest gun was a minion cannon which was brass, weighed about 1,200 pounds (545 kg), and could shoot a 3.5 pound (1.6 kg) cannonball almost a mile (1,600 m). She also had a saker cannon of about 800 pounds (360 kg), and two base cannons that weighed about 200 pounds (90 kg) and shot a 3 to 5 ounce ball (85–140 g). She carried at least ten pieces of ordnance on the port and starboard sides of her gun deck: seven cannons for long-range purposes, and three smaller guns often fired from the stern at close quarters that were filled with musket balls. Ship's Master Jones unloaded four of the pieces to help fortify Plymouth Colony against invaders. 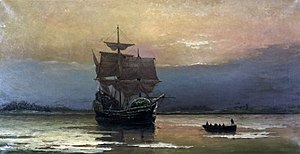 There were 26 vessels bearing the name Mayflower in the Port Books of England during the reign of James I (1603–1625); it is not known why the name was so popular. The identity of Captain Jones's Mayflower is based on records from her home port, her tonnage (est. 180–200 tons), and the master's name in 1620 in order to avoid confusion with the many other Mayflower ships. It is not known when and where the Mayflower was built, although late records designate her as "of London". She was designated in the Port Books of 1609–11 as "of Harwich" in the county of Essex, coincidentally the birthplace of Mayflower master Christopher Jones about 1570. Records dating from August 1609 note Christopher Jones as master and part owner of the Mayflower when his ship was chartered for a voyage from London to Trondheim in Norway and back to London. The ship lost an anchor on her return due to bad weather, and she made short delivery of her cargo of herrings. Litigation resulted, and this was still proceeding in 1612. According to records, the ship was twice on the Thames at London in 1613, once in July and again in October and November, and in 1616 she was on the Thames carrying a cargo of wine, which suggests that the ship had recently been on a voyage to France, Spain, Portugal, the Canaries, or some other wine-producing land. Jones sailed the Mayflower cross-Channel, taking English woolens to France and bringing French wine back to London. He also transported hats, hemp, Spanish salt, hops, and vinegar to Norway, and he may have taken the Mayflower whaling in the North Atlantic in the Greenland area or sailed to Mediterranean ports. After 1616, there is no further record which specifically relates to Jones's Mayflower until 1624. This is unusual for a ship trading to London, as it would not usually disappear from the records for such a long time. No Admiralty court document can be found relating to the pilgrim fathers' voyage of 1620, although this might be due to the unusual way in which the transfer of the pilgrims was arranged from Leyden to New England, or some of the records of the period might have been lost. Jones was one of the owners of the ship by 1620, along with Christopher Nichols, Robert Child, and Thomas Short. It was from Child and Jones that Thomas Weston chartered her in the summer of 1620 to undertake the Pilgrim voyage. Weston had a significant role in the Mayflower voyage due to his membership in the Company of Merchant Adventurers of London, and he eventually traveled to the Plymouth Colony himself. Both ships set sail for America around August 5, but the Speedwell sprang a leak shortly after, and the two ships were brought into Dartmouth for repairs. They made a new start after the repairs, and they were more than 200 miles (320 km) beyond Land's End at the southwestern tip of England when Speedwell sprang another leak. It was now early September, and they had no choice but to abandon the Speedwell and make a determination on her passengers. This was a dire event, as the ship had wasted vital funds and was considered very important to the future success of their settlement in America. Both ships returned to Plymouth, where some of the Speedwell passengers joined the Mayflower and others returned to Holland. The Mayflower then continued on her voyage to America, and the Speedwell was sold soon afterwards. On November 9, 1620, they sighted present-day Cape Cod. They spent several days trying to sail south to their planned destination of the Colony of Virginia, where they had obtained permission to settle from the Company of Merchant Adventurers. However, strong winter seas forced them to return to the harbor at Cape Cod hook, well north of the intended area, where they anchored on November 11. The settlers wrote and signed the Mayflower Compact after the ship dropped anchor at Cape Cod, in what is now Provincetown Harbor, in order to establish legal order and to quell increasing strife within the ranks. During the winter, the passengers remained on board the Mayflower, suffering an outbreak of a contagious disease described[by whom?] as a mixture of scurvy, pneumonia, and tuberculosis. When it ended, only 53 passengers remained—just over half; half of the crew died, as well. In the spring, they built huts ashore, and the passengers disembarked from the Mayflower on March 21, 1621. According to the Mayflower passenger list, just over a third of the passengers were Puritan Separatists who sought to break away from the established Church of England and create a society along the lines of their religious ideals. Others were hired hands, servants, or farmers recruited by London merchants, all originally destined for the Colony of Virginia. Four of this latter group of passengers were small children given into the care of Mayflower pilgrims as indentured servants. The Virginia Company began the transportation of children in 1618. Until relatively recently, the children were thought to be orphans, foundlings, or involuntary child labor. At that time, children were routinely rounded up from the streets of London or taken from poor families receiving church relief to be used as laborers in the colonies. Any legal objections to the involuntary transportation of the children were overridden by the Privy Council. For instance it was proven that the four More children were sent to America because they were deemed illegitimate. Three of the four More children died in the first winter in the New World, but Richard lived to be approximately 81, dying in Salem, probably in 1695 or 1696. Passengers would pass the time by reading by candlelight or playing cards and games such as Nine Men's Morris. Meals on board were cooked by the firebox, which was an iron tray with sand in it on which a fire was built. This was risky because it was kept in the waist of the ship. Passengers made their own meals from rations that were issued daily and food was cooked for a group at a time. The passenger William Mullins brought 126 pairs of shoes and 13 pairs of boots in his luggage. Other items included oiled leather and canvas suits, stuff gowns and leather and stuff breeches, shirts, jerkins, doublets, neckcloths, hats and caps, hose, stockings, belts, piece goods, and haberdasherie. At his death, his estate consisted of extensive footwear and other items of clothing, and made his daughter Priscilla and her husband John Alden quite prosperous. Captain: Christopher Jones. About age 50, of Harwich, a seaport in Essex, England, which was also the port of his ship Mayflower. He and his ship were veterans of the European cargo business, often carrying wine to England, but neither had ever crossed the Atlantic. By June 1620, he and the Mayflower had been hired for the Pilgrims voyage by their business agents in London, Thomas Weston of the Merchant Adventurers and Robert Cushman. Masters Mate: John Clark (Clarke), Pilot. By age 45 in 1620, Clark already had greater adventures than most other mariners of that dangerous era. His piloting career began in England about 1609. In early 1611, he was pilot of a 300-ton ship on his first New World voyage, with a three-ship convoy sailing from London to the new settlement of Jamestown in Virginia. Two other ships were in that convoy, and the three ships brought 300 new settlers to Jamestown, going first to the Caribbean islands of Dominica and Nevis. While in Jamestown, Clark piloted ships in the area carrying various stores. During that time, he was taken prisoner in a confrontation with the Spanish; he was taken to Havana and held for two years, then transferred to Spain where he was in custody for five years. In 1616, he was finally freed in a prisoner exchange with England. In 1618, he was back in Jamestown as pilot of the ship Falcon. Shortly after his return to England, he was hired as pilot for the Mayflower in 1620.
Cooper: John Alden. Alden was a 21-year-old from Harwich in Essex and a distant relative of Captain Jones. He hired on apparently while the Mayflower was anchored at Southampton Waters. He was responsible for maintaining the ship's barrels, known as hogsheads, which were critical to the passengers' survival and held the only source of food and drink while at sea; tending them was a job which required a crew member's attention. Bradford noted that Alden was "left to his own liking to go or stay" in Plymouth rather than return with the ship to England. He decided to remain. John Allerton: A Mayflower seaman who was hired by the company as labor to help in the Colony during the first year, then to return to Leiden to help other church members seeking to travel to America. He signed the Mayflower Compact. He was a seaman on ship's shallop with Thomas English on exploration of December 6, 1620, and died sometime before the Mayflower returned to England in April 1621. "Master" Leaver: Another passenger not mentioned by Bradford is a person called "Master" Leaver. He was named in Mourt's Relation, London 1622, under a date of January 12, 1621 as a leader of an expedition to rescue Pilgrims lost in the forest for several days while searching for housing-roof thatch. It is unknown in what capacity he came to the Mayflower and his given name is unknown. The title of "Master" indicates that he was a person of some authority and prominence in the company. He may have been a principal officer of the Mayflower. No more is known of him; he may have returned to England on the Mayflower's April 1621 voyage or died of the illnesses that affected so many that first winter. What finally became of the Mayflower is an unsettled issue. Charles Edward Banks, an English historian of the Pilgrim ship, claims that the ship was finally broken up, with her timbers used in the construction of a barn at Jordans village in Buckinghamshire. Tradition claims that this barn still exists as the Mayflower Barn, located within the grounds of Old Jordan in South Buckinghamshire. 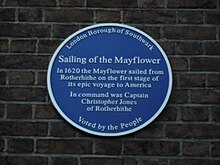 In 1624, Thomas Russell supposedly added to part of a farmhouse already there with timbers from a ship, believed to be from the Pilgrim ship Mayflower, bought from a shipbreaker's yard in Rotherhithe. The well-preserved structure was a tourist attraction, receiving visitors each year from all over the world and particularly from America, but it is now privately owned and not open to the public. Another ship called the Mayflower made a voyage from London to Plymouth Colony in 1629 carrying 35 passengers, many from the Pilgrim congregation in Leiden that organized the first voyage. This was not the same ship that made the original voyage with the first settlers. This voyage began in May and reached Plymouth in August. This ship also made the crossing from England to America in 1630 (as part of the Winthrop Fleet), 1633, 1634, and 1639. It attempted the trip again in 1641, departing London in October of that year under master John Cole, with 140 passengers bound for Virginia. It never arrived. On October 18, 1642, a deposition was made in England regarding the loss. The 400th anniversary of the Mayflower sailing will take place in 2020. The Harwich Mayflower Heritage Centre is hoping to build a replica of the ship at Harwich, England. ^ a b Johnson 2006, p. 33. ^ Johnson 2006, p. 30. ^ a b Johnson 2006, p. 31. ^ a b Johnson 2006, pp. 30–31. ^ Johnson 2006, p. 195. ^ Johnson 2006, pp. 25, 28, 31. ^ a b Johnson 2006, pp. 32–33. ^ Johnson 2006, p. 32. ^ Johnson 2006, p. 33–34. ^ Johnson 2006, pp. 34, 46. ^ a b Johnson 2006, p. 35. ^ Johnson 2006, p. 34. ^ Johnson 2006, pp. 34–35. ^ Johnson 2006, pp. 71–72, 14. ^ Johnson 2006, p. 141. ^ Johnson 2006, pp. 240–242. ^ "About Us". Harwich Mayflower Heritage Centre. Retrieved 14 April 2018. Wikisource has the text of the 1911 Encyclopædia Britannica article Mayflower. "Mayflower, The" . Encyclopedia Americana. 1920.